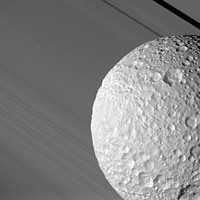 Mimas [MY-mas] is the seventh of Saturn's known moons in order of orbit and is also the seventh largest. It is the 20th largest moon in the Solar System and is the thought to be the smallest to have its shape rounded by its own gravity. It was named after one of the Greek Titans who was the son of Gaia and was slain by Hercules. 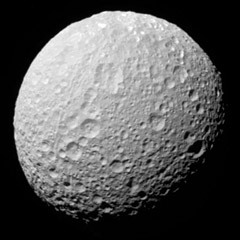 Mimas was discovered by the British astronomer, Sir William Herschel in 1789. Most of what we now know about Mimas was discovered during the two Voyager missions. Although the surface of Mimas is heavily cratered, the most striking feature of this small moon is a gigantic crater known as Herschel. 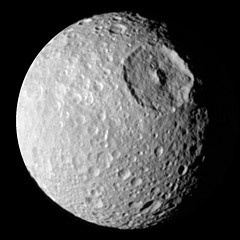 It was named after Mimas' discoverer, Sir William Herschel. This crater measures a whopping 80 miles (130 km) across. A central peak in the center of the crater rises to a height of 4 miles, almost as high as Mount Everest on Earth. Since Mimas is only 242 miles (392 km) in diameter, this crater is almost 1/3 of the entire moon's diameter! 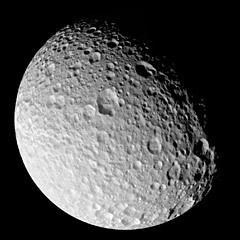 Astronomers believe that if the object that caused this impact had been any larger, it would have completely destroyed Mimas. This impact was so devastating, in fact, that fracture marks can be found on the opposite side of the moon from the crater. 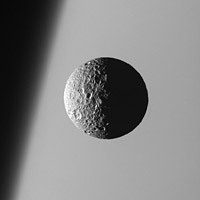 This giant scar gives Mimas the look of a giant eyeball in some photos. Those of you who are Star Wars fans will no doubt see another resemblance. The low density of Mimas indicates that it is composed almost entirely of water ice, very much like Dione and Rhea. 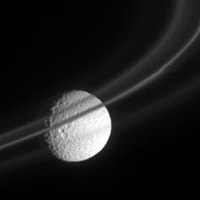 Mimas is also covered with small impact craters, but the cratering is not even. Most of the craters average about 25 miles (40 km) in diameter, but craters in the South Polar Region average only 12 miles (20 km). This suggests something may have covered up the larger craters. The fact that none of the other craters are as large as Herschel have led some astronomers to speculate that a previous impact may broken the moon into pieces, which then coalesced to reform the moon into what we see today. Mimas has no detectable atmosphere and no magnetic field.